Bald is beautiful! See why women with hair loss are shedding their wigs to embrace a natural look. Forget the filters and "perfect" posts — TODAY Style is getting real! This week is all about being honest, authentic, transparent and, well, real about everything, from wrinkles and body image to dressing room anxiety and aging. Use the hashtag #RealWomenHave _____ to share the topic about which YOU want to get real. Countless women with alopecia are choosing to ditch their wigs and go bald. Alopecia, an autoimmune condition that causes hair loss, can come in many forms affecting 6.8 million people in the United States alone, according to the National Alopecia Areata Association. And of the millions with hair loss, 40 percent of those are women, says the American Hair Loss Association. While many women choose to wear wigs, several others are deciding to embrace the beauty of being bald. Here are a few of their brave and touching stories. 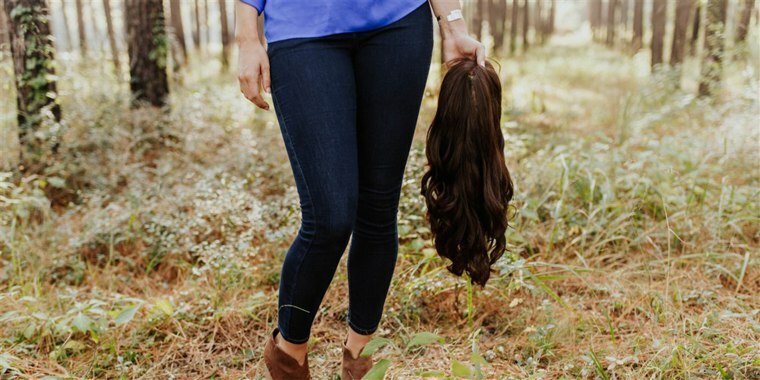 Mackenzee Meaux, a 21-year-old college student from Crosby, Texas, faced her fears by removing her wig during her engagement photo shoot. She called it “probably the most difficult thing I will ever do in my life,” in a Facebook post. She had been considering it for several weeks before the shoot. Meaux first learned she had alopecia after some school friends teased her for having a bald spot when she was 8 years old. Less than six months later, all of the hair on her body had fallen off. Since then, hesitant to tell anyone about her condition, Meaux has worn a custom wig. “I’ve hidden this for so long. It’s time I learn to accept myself,” Meaux told TODAY Style. Gianessa Wride, 7, put a positive spin on crazy hair day at school by covering her head in bejeweled stickers in various shapes, like flowers and an owl. Her mom explained that wigs can be itchy on her scalp, so Wride prefers to leave it natural, despite the bullying she has endured. “I want to let her embrace it and love herself as she is right now,” her mother told TODAY. Although Wride was nervous to display her style at school, she ended up changing her mind. “This is awesome. I love it,” the first-grader said. Coco Labbee is taking the modeling world by storm, bald and all! The 19-year-old model spent years hiding her bald spots under perfectly styled wigs, but recenly made the choice to shave her head in October 2017. “I have never felt so free, it’s a huuuge relief,” Labbee wrote on Instagram. College isn’t always easy. There can be tough courses and judgmental classmates, but this University of Connecticut senior won’t let being bald stop her from having the time of her life. On Valentine’s Day, Vanessa Rosa celebrated her two-year “baldaversary” and took to Instagram to celebrate. Madisyn Babcock’s life was turned upside down when she was diagnosed with alopecia as a high school senior, but instead of hiding her hair loss, Babcock celebrated her bald head in gorgeous senior photos. The 17-year-old had her mother, an artist, paint flowers on her head for the shoot. The flowers are a special symbol to Babcock because they remind her of herself since she's "blossomed into someone I never thought I would be, but I wouldn’t change it for the world." “I’ve learned so much about myself since I lost my hair,” Babcock told TODAY. “I’ve grown a new sense of empathy and self love. Losing my hair made me feel vulnerable, which made me dig down deep into my personality and do some self-finding. I look at world in a much more positive and beautiful way ... I learned that true beauty really does come from the inside." “I don't want to be always lying about whether I'm wearing a wig or hiding at all, I wana be confident about it and embrace it and hope everyone around me will accept me for me, as it’s something completely out of my control,” Wright wrote on Instagram. This mom-and-daughter duo are supporting each other when it comes to alopecia. Rachel Regal, when faced with the decision between buying groceries for her family and paying for a wig for herself, chose to display her bald head proudly. Now, she hopes she can inspire her young daughter, who was 6-years-old when diagnosed, to love herself despite the hair loss.